Gelberg Signs was founded by William P. Gelberg in 1941 and was purchased by the Brami family - brothers Guy, Luc and Neil - in 1988, after their father, Georges Brami, spent his career with the company. 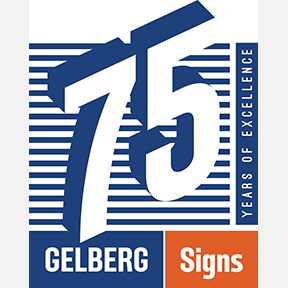 Gelberg Signs has maintained a track record of successful business operations and financial stability since its very first days in business. Operating from a 35,000 square foot facility in NW DC, the company continues to grow and take on exciting new projects in and around the District. Gelberg Signs is the premier sign company in the Washington DC metropolitan area in the eyes of their clients and that of their employees. Our clients are delivered quality products and the highest level of services in a timely manner and at a fair and competitive price. Our employees are treated with respect in a professional working environment that includes opportunities for advancement, cross training programs, competitive wages, and excellent benefits. We will provide quality products and services to our customers on a national scale with dedication and commitment from our employees, management, and owners. Gelberg Signs'™ turnkey approach to total signage solutions will enable the customer to concentrate their efforts on the operations of their business. We will serve our customers with confidence and knowledge. We will strive for continual product enhancements and service improvements through research, design, and development. We will maintain customer confidence through effective and efficient communications. We will grow as individuals with loyalty and respect for our coworkers, vendors, and customers and through financial stability, personal development and opportunity our employees will have a sense of security and belonging. View more work at Gelberg Signs.